Synopsis: Police chief Brody must protect the citizens of Amity after a second monstrous shark begins terrorizing the waters. Review: Even though it swims in the shadow of what is arguably one of the most memorable films in history and having been released at a time when sequels weren’t all that popular, this follow-up to Steven Spielberg’s landmark 1975 scare fest still gets a lot of things right. I get the feeling that over the years any dissatisfaction with Jaws 2 by movie-goers was probably unavoidable considering the perfection of the original. 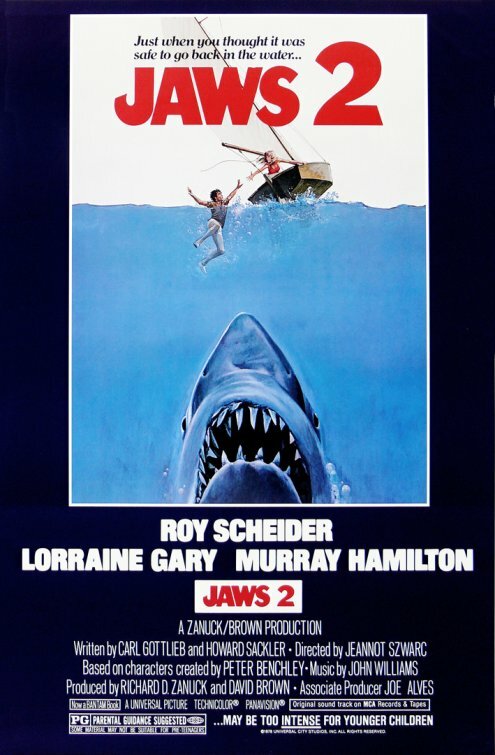 A troubled production that went way over-budget (as did Jaws), Jaws 2 picks up a few years after that marauding great white shark all but ruined the summer beach season on Amity Island. Right about the time that the town is done picking up the pieces, wouldn’t you know it…. another shark rears its dorsal fin and picks off more than a few New Englanders before setting its sights on a regatta of teens out for a sailing spree. The original Jaws seems timeless to me, I can watch it now and still feel like it could have taken place yesterday. Part of that was Spielberg’s light touch with island life and a pleasant “away from it all” feeling when you were on Amity. Jaws 2 tends to show its age…starting with its opening moments at a celebration for the ribbon-cutting at a brand new Holiday Inn on the island. The late 70’s clothing, hair, and other cultural touchstones make an appearance here which aids in the film feeling very much a product of its time. Though the producers of the film couldn’t get Spielberg and original star Richard Dreyfuss back, Roy Scheider was pretty much obligated to appear and rumor has it that he didn’t enjoy his time on the set. That sour attitude doesn’t translate to his performance though, and his Chief Brody is again the quiet everyman sort of hero once again ignored by the town when he starts to piece together that another shark is visiting Amity. It’s nice to see Lorraine Gary back as his wife, this time getting a beefed up role that keeps her present in the action, not just waiting at home for her husband to return. The rest of the cast is filled with a group of pleasant younger actors that do what they can with their hastily sketched out archetype characters. It’s well documented that the mechanical shark on the original film wasn’t very cooperative, forcing Spielberg to suggest the shark more than he showed it. The shark on this film is ready for his close-up fairly early on and an inventive placement of the camera on top of the shark gives you a nice fish eye view of his hunt. While it can’t even get in the stratosphere of the first film, this is a worthy sequel that gives the audience what they came to see without feeling like a cheap cash-in on the success of the previous film.